Dementia and Alzheimer’s are typically referred to as separate ailments, but are actually one-in-the same. Dementia itself is not a single disease, but rather a term for the decline in mental ability severe enough to disrupt everyday life. Among the different forms of dementia are Vascular dementia, Frontotemporal dementia, and the most common dementia-related illness, Alzheimer’s. Unlike many other age-related illnesses like Parkinson’s and Multiple Sclerosis (MS), dementia is focused solely on the brain. Brain cells become damaged, and in turn are unable to pass information normally. A thorough examination is performed to determine if dementia is present, and if you or a loved one is diagnosed with dementia, it is best to take action early to limit the symptoms. There is no known cure for dementia and Alzheimer’s. If you or someone you love has been diagnosed, the best course of action is to first treat any conditions that worsen symptoms including alcohol abuse, vitamin deficiencies, and medication side effects. While age and genetics play a major role in developing dementia, the following factors may play a role in alleviating symptoms and/or preventing the disease. Cardiovascular health: Damage to blood vessels anywhere in your body can also damage brain cells. Limit harm to your blood vessels by not smoking, maintaining a healthy weight, and practicing a diet with low cholesterol and blood sugar. Exercise: Increased blood and oxygen flow, a benefit of physical exercise, may help lower the risk of dementia. All-in-all, dementia sufferers are one of the most difficult to care for. 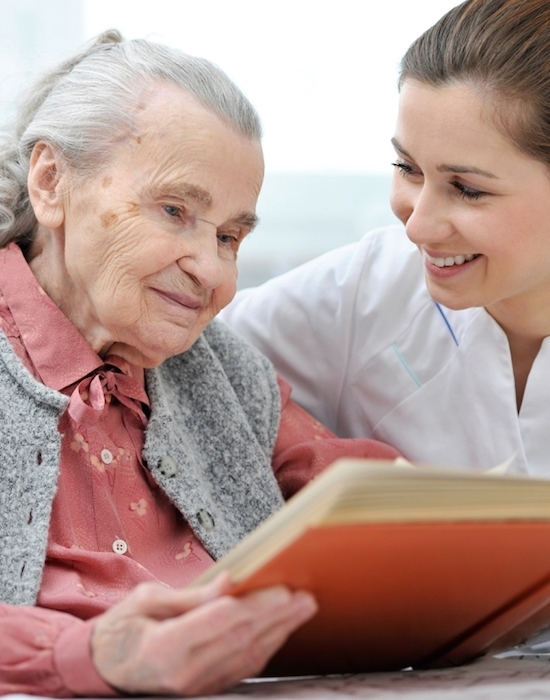 The physical and emotional toll of caring for a family member with dementia is high. For this reason, many of those with dementia decline more quickly given the lack of tools and knowledge available to family/friend caretakers. Once a loved one is diagnosed with dementia, it is recommended to seek out help from a licensed caretaker, nurse, or a Memory Care facility like Sandyside. Sandyside Senior Living is Southeast Michigan’s premier Dementia Care facility. A 20 bed memory care facility, Sandyside focuses on excellent care for those with Dementia/Alzheimer’s along with age related illness and general debility. Our commitment to is to our families, and that starts and ends with our exceptional team members. 24/7 MEMORY CARE. SANDYSIDE SPECIALIZES IN MEMORY-RELATED ILLNESS LIKE DEMENTIA/ALZHEIMER’S. OUR EXPERIENCED STAFF KNOWS HOW TO MEET THE NEEDS OF YOUR LOVED ONE. PERSONALIZED CARE. SANDYSIDE’S PROFESSIONAL STAFF PROVIDES EXPERT MEDICAL CARE FOR DEMENTIA PATIENTS… AND DOES IT WITH WARMTH, LOVE, AND A FRIENDLY SMILE. IT MEANS NO WORRIES. FRIENDLY STAFF, UNBEATABLE AMENITIES, AND COMMUNAL EVENTS MEAN OUR RESIDENTS SPEND LESS TIME WORRYING AND MORE TIME ENJOYING THEMSELVES!